In December 2015, I attended the United Nations Framework Convention on Climate Change (UNFCCC) negotiations at the 21st Conference of the Parties (COP21) and other ongoing events at the COP, joining almost 40 members of the IISD Reporting Services team in Paris. My team covered the Rio Conventions Pavilion – linking the 3 UN conventions on biodiversity, climate change and sustainable land management. Of course most attention (and rightfully so) centered on the +2 weeks negotiations, resulting in the historic and universally adopted Paris Agreement by nearly 200 parties. Each day we arrived at 10:00, often leaving around midnight, after publishing daily reports. To say that it was an exhausting, exhilarating, jam-packed 2 weeks is an understatement. I’m still trying to wrap my head around all of it. And so, I apologize if this blog post is clouded in randomness or too many hyperlinks. With time, I believe the full magnitude of what was accomplished in Paris (including its shortcomings) will become clear. But for now, allow me to digress in the lingering excitement and chaos that was COP21. While most multilateral environmental negotiations receive limited media coverage, climate change has always been a hot topic. COP21 was attended by circa 36,000 attendees, and covered by a plethora of news media sources, bloggers, researchers, civil society outlets – adding perspectives and insights on the strengths and weaknesses of COP21’s negotiations and the final agreement. 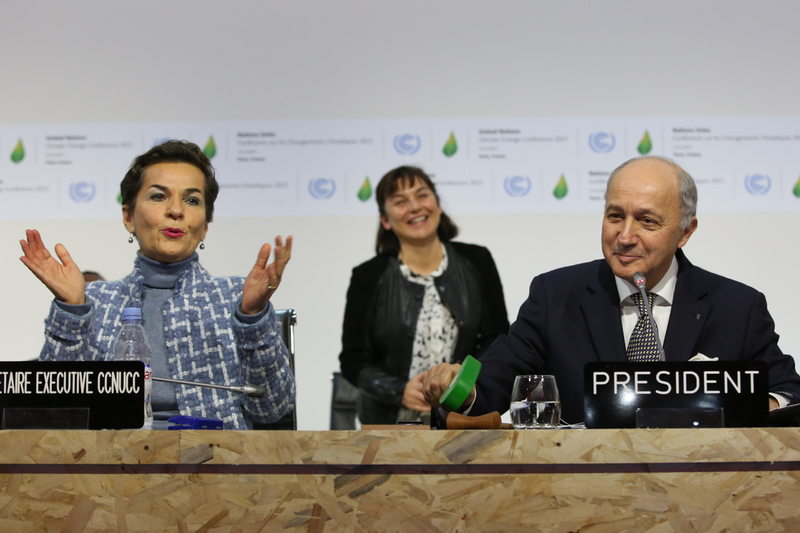 Here are but a few of sources, recapping COP21’s highlights. World Resource Institute offers a quick depiction of COP21’s major achievements (below). The Conversation discusses 5 things to know about the Paris Agreement. Climate Home reported on key figures and events at COP21 (including a play-by-play of 12 December) as well as more generally regarding climate change science and diplomacy. 350.org depicts civil society events in Paris and globally, while calling for continued engagement. Many events (and coverage) were also dedicated to urban action at COP21, by ICLEI and partners, at the Cities and Regions Pavilion. But as urban climate action is a subject I’m quite interested in, I’ll save that for a separate blog post. IISD RS’s Earth Negotiations Bulletin (ENB) team was at COP21 for the full 2+ weeks, to document the negotiations’ play-by-play, providing daily web coverage and reports, as well as a final summary and analysis of COP21 and the Paris Agreement. ENB also received a special shout out from the New York Times, “For basic developments at the negotiations, there’s no better source than the Earth Negotiations Bulletin.” And for those less familiar with the 20+ years of UNFCCC negotiations which led to the Paris Agreement, IISD RS produced 4 short films, discussing with key players in the Paris Knowledge Bridge project. 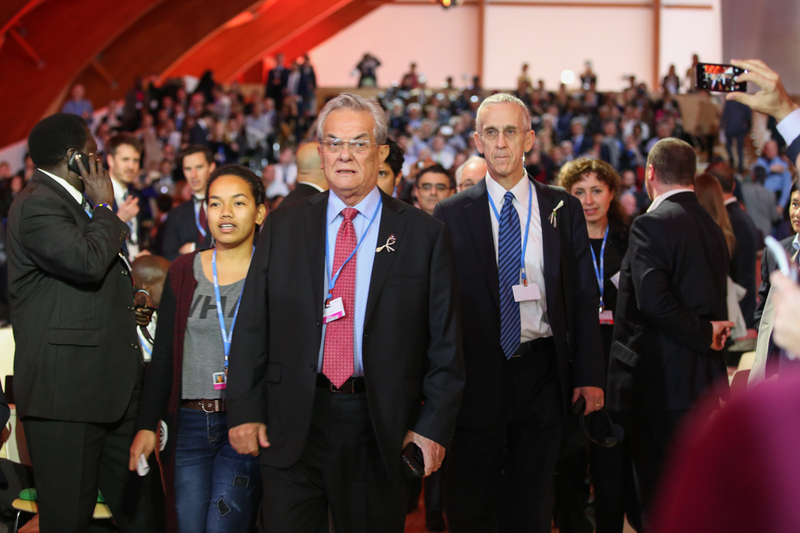 COP21 needed to succeed, and how fitting that it would find symbolic and real leadership from many actors, not least motivation from the Marshall Islands’ Tony de Brum – a man who knows firsthand the impacts of climate change on small island states. De Brum played a critical role to secure the final agreement, becoming the de-facto leader of what became known as the High Ambitions Coalition. A man who demonstrated the importance of addressing climate change for future generations, handing over his microphone to 18-year old Selina Leem to make the Marshallese final statement. This coalition helped turn the tide of COP21, as parties joined in growing numbers at the end of COP21. In the early morning, as wide-eyed delegates trickled from the COP venue, Le Bourget, in a state of satisfied delirium, many joined an after-hours party to celebrate the success. As Figueres entered the room, hugging every delegate on site and joining many on the dance floor, the crowd broke into chorus: “We are the Champions…” COP21 was perhaps the epitome of the phrase: work hard, party hard. And then, work harder.